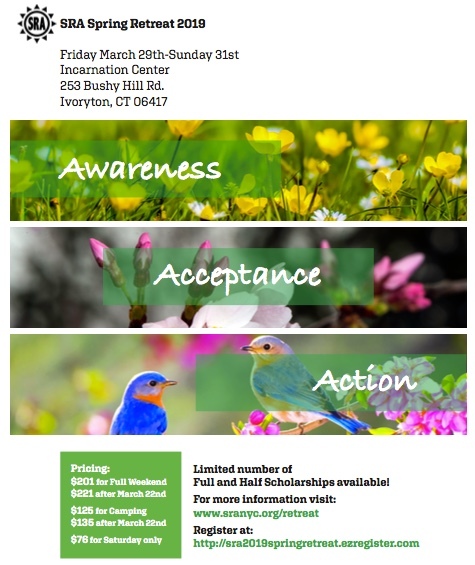 Registration is now open for the 2019 Spring SRA retreat! Limited number of Full and Half Scholarships available! Meals & linens included for weekenders. Single rooms assigned on a first-come-first-served basis. All meals are buffet-style. Each includes a vegetarian option. Anyone on a special diet must bring their own food with them. Refrigerators are available for storage. Transportation to the center is available. Double-room approximately $70 per night. We ask that you bring any questions or concerns exclusively to the Chairpersons rather than the Incarnation Center. Thanks. Please note, as of Monday, October 2nd, the meetings at St. Peter’s Church on Fulton Street in Manhattan will change times and location. To get to St. Margaret’s house, take the 2 or 3 train, or A or C train to the Fulton Street Station. Margaret house is between Cliff Street and Pearl Street. The Meeting List page and Calendar have also been updated to reflect these changes. Please note that an SRA Meeting is now taking place on Saturday Mornings in Little Falls, NJ. Meeting Time: Saturday 7:30 a.m. to 8:45 a.m. Please note — starting on Monday, September 26th, the Monday night meeting at St. Jean Baptiste (76th and Lex) will move to the Caron Foundation, located at 244 East 58th Street (between 2nd and 3rd ave). The meeting time remains the same — 6:15PM. Please note, the 6pm–7:30pm Thursday meeting at St. John’s, 30th Street between 7th and 8th, has closed. Please see our meeting list or calendar for an up-to-date list of currently available meetings.